Style meets substance at Columbus Airport Marriott. After touching down at John Glenn Columbus International Airport, take the complimentary shuttle to our hotel only 1 mile away. Discover easy travel to Northeast Columbus, Easton Town Center, Franklin Park Observatory and Ohio Dominican University as well. Walk into a modern ambiance as soon as you enter our elegant lobby. Then settle into our spacious accommodations featuring delicious room service, pillow top mattresses and ergonomic workstations. Upgrade your stay to our exclusive concierge-level rooms and gain access to our M Club Lounge serving complimentary breakfast and hors d'oeuvres. Savor a bite to eat at our RiverCity Grille serving delectable steaks and seafood. After a satisfying meal, get in a workout at our 24-hour fitness center. Our hotel provides for all of your business and leisure needs. Professionals can make use of our many event rooms with AV equipment. 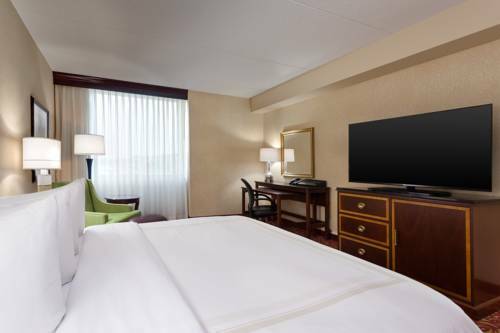 Whatever your reason for travel, elevate your stay at Columbus Airport Marriott. RiverCity Grille: Take your taste buds on an adventure at RiverCity Grille, our casual restaurant. We offer a wide-ranging menu from small bites, salads and soups to indulgent seafood and grilled steaks. Bring the whole family and enjoy our inviting atmosphere. RiverCity Grille Lounge: In need of a quick snack or just want to relax with friends over drinks? Visit our RiverCity Grille Lounge for casual dishes at our Columbus hotel. Take in the relaxed ambiance and unwind after your flight at the Columbus airport.